This article is about how to teach a parrot the wave trick. The trick involves the trainer cuing the parrot to wave by either waving at the parrot or saying wave and then the parrot picks up its foot to wave at the audience. Before you can teach your parrot the wave trick, it must already be familiar with taking treats from your hand and should ideally by clicker/target trained as well. The parrot will understand that you are trying to teach it a behavior much quicker if it has already learned the basics of learning by doing the target trick previously. So if your parrot is not hand tame or does not know the target trick, here is a helpful article so that you can teach that prior to beginning training wave. However, an essential requisite of this trick is that the parrot knows how to step up already. Training the wave trick believe it or not is quite simple. Any parrot can learn to wave including small parakeets such as budgerigars. The number one training tool required to teach this trick is patience. Some parrots might pick it up in a day and it could take months to teach others. If you practice this trick consistently every day with your parrot, I guarantee you that eventually it will learn it. Also you will need treats, a training perch, and a clicker is optional. I found that a clicker is helpful toward the end of the wave training but mostly a burden in the beginning. I started out by using the clicker the first few tries I did to teach wave to Truman and it was more trouble than it was worth. The clicker can be used once your hands are freed up but best left out of the first portion unless you have someone else to help you. The actual mechanism for teaching the trick is very simple. You pretend like you are asking the parrot to step up by approaching your extended finger to it and just as it lifts its foot, you retract your finger and reward the bird. This comes as a two step process. The first step is to get the parrot to learn to pick its foot up at the sight of your extended finger and the second step is to teach it to do that when you wave your hand instead. Therefore the first cue that is taught is only temporary until the main cue can be learned. You are going to need to decide which foot you want your parrot to wave with. It has been my preference to teach the parrot to wave with the opposite of its dominant foot. This is because they often lift their dominant foot up to eat so it looks more impressive when they wave with one and then eat with the other rather than going up and down with the same foot twice. Remember to be consistent about training wave only to a single foot or the parrot will get confused. Start by having your parrot on a perch (ideally a training stand). Have it just below eye level and stand facing the bird. You will need to ask the parrot to step up with the hand that is closest to the foot you have chosen for the parrot to wave with. Truman is left footed so I wanted to teach him to wave his right foot. When I am facing him, it's like a mirror image so I need to use my left hand to get him to pick up his right foot. Therefore my right hand is free to wave at him while I approach him with my left hand. The hand used for lifting the foot is aimed with the pointer finger parallel to the perch upon which the parrot is standing. Do not let the parrot actual step onto your hand but approach the finger as close as necessary to have it lift its foot. As soon as the foot starts coming up, back that finger away just a bit so that it cannot actually grab on and step up. Immediately praise and reward the parrot with a treat. Practice this for a few training sessions. The next step is to begin to recede the step up cue. In the beginning the parrot is merely responding to step up and trying to do that. It will never learn to wave as long as it is focused on the concept of stepping up. So every so often while practicing the above steps. Hold the outstretched finger further from the parrot and see if it responds. It may be learning quicker than you think but if you keep approaching closely with the finger, you won't get to find out. So try holding the finger six inches away, then fours, two, etc. If it is not responding unless up close, then practice up close a few more times. Eventually test the parrot again in this same fashion. Eventually it will surprise you because it realized what to do. Remember to keep training sessions reasonably short and end on a good note. When you have made some consistent progress, end things while they are good rather than letting your parrot's attention dwindle and frustration build up. Eventually you'll get to a point where picking the foot up is all the parrot wants to do. It begins anticipating the treat and lifting its foot when you haven't even asked. This is the golden opportunity to get it to learn it on the proper cue. It starts getting in the habit of lifting its foot and getting treats repeatedly. Now one time you just skip the finger cue and just do the waving hand cue and the parrot will pick up its foot anyway from the inertia of repetition built up from prior training sessions. Now finally this becomes a parrot trick. After this point it will just be a matter of practice. There is the possibility of the parrot forgetting again but a quick reminder with the finger cue will get it back to doing the trick properly. I suggest showing the waving hand cue right from the very start and saying "wave" (or whatever you want the verbal cue to be) immediately from the start. This lets the parrot get used to seeing/hearing the proper cue earlier and becoming aware of its simultaneous presence to the outstretched finger cue. In the beginning I hold the treat between my fingers of the hand I wave with so that I can offer the treat as soon as the bird picks its foot up but once the parrot is doing the trick on cue, I put a clicker/treat in the hand I'm not waving with. I taught Truman to wave in a total of five training sessions. The reason I label them by session rather than day is because some days I did two sessions. So while it took five sessions, they spanned a total of four days. I did a few micro sessions in between to keep his mind on wave but they did not bring forth and progress worth mention. Basically I'd practice whatever stage of wave training I was at at different times of the day on top of normal training. This helps expedite things just a little bit. The first session was mostly dedicated to getting him used to picking his foot up. The second and third session was about him seeing the finger cue for lifting his foot up. The fourth session reduced the importance of the finger cue by holding it progressively further and further away. And then finally by the fifth session it dawned on Truman that he actually has to lift his foot up when he sees the waving hand cue rather than the finger. I am going to continue practicing the wave with him until he is very consistent with the trick and then I won't wait any longer before introducing him to a new trick. I don't want him to get so used to wave that he becomes resistant to learning other tricks. Here is a video of the actual training sessions where I taught Truman how to wave. The video illustrates the techniques mentioned above for training. It is a bit long but it accurately depicts the progression of learning for the trick. The video is not in actual time. I probably spent closer to 3 hours training Truman and I would estimate that I had performed the trick at least 50 times until he began doing it off of the proper wave cue. Here are some additional tips for teaching the wave. Don't seek perfection from the very start. In the beginning it is important that the parrot make any positive motion to lift its foot to your outstretched finger on its own. Even if it is lifting it briefly and not very high, that's ok. The important thing is to teach it the motion. Then once it learns the trick and is picking its foot up on cue, you can start rejecting the worst ones and rewarding the best instances. So at first it might be waving for 1/4 of a second so you don't reward the 1/8 second waves but you do the 1/4. Then you start rewarding only 1/2 second, etc. Same things goes for height. At first you reward any motion to pick the foot up even if it's only a tiny bit off the ground. Eventually you start rewarding the best ones of the capability of the parrot at that particular stage in training. A good rule of thumb is to always reward the best 4 out of 5. Don't reward the worst one. Even if the 4 aren't up to your desired standards, it will certainly improve because at least the worst ones are being discarded and the parrot is learning how to favor the better ones. This will take time but it will improve results. Not rewarding too many trials will only discourage the parrot from waving in the first place so be sure to reward the effort as much as possible. This trick is suitable as a first trick (assuming reasonable tameness and step up) for any parrot including parakeet, cockatiel, lovebird, parrotlet, conure, poicephalus, african grey, amazon, cockatoo, or macaw. This is a wonderful beginner trick that anyone can train their parrot with just a bit of patience. 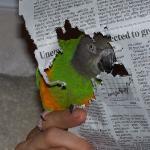 I hope you find this article helpful and wish you luck training your parrot. If you have any questions please use the link below to post them through the parrot forum. I love this video. Thanks for breaking it down. I plan to do this with one of my five senegals. I hope to make a short video of the progress so that you can see how well he did by using your methods. One of the most amusing things to watch is Kili in this video. She's so adorable. She waves, and waves when you're giving the command to Truman. Very cute. Can you tell us all how you made your training perches? The training perches will become available for sale online in the course of the upcoming week. I have finalized the design and now just need to get a website up to make them available. Check back soon. Yay! I will look forward to purchasing one (or more) from you. I'm very glad to know that you are planning to make a profit from some of the wonderful work you do. It takes so much time to not only train, but make the movies, write the blog, etc. You really deserve more than just praise. Hi Michael, I've seen your work with Kili and Truman on Youtube and I also think you're doing wonderful work and thank you for sharing your experiences in working with them. My best friend is Nene a yellow naped and I've been following your guidence for training him. Thank you again. Really good informative training advice.Thanks very much. Could I ask what you use as treats? everythingI have tried does not seem to work,and I have tried lots of different ones. Try bits of crackers like goldfish or cheezits. Thank you so much!, Mr Parrot (My Alexandrine) learned this trick in day twos! Your blog has truly helped me and my Alex's bond get closer!. This is SOOO not working with my 'tiel! If I get my finger up close enough to him to make him start to step up he's got hold of my finger with his beak (gently) and has one foot already on me before I can withdraw it. I just can't get enough of a gap in there to withdraw and treat. When I try and pull my finger back more away from him he's teetering as far forward as he can to get to my finger with his beak. If I pull back even more he's just running back and forth on the perch trying to do what I'm asking because he's clearly under the impression I want him to step up. He's trying so hard! I've had to stop before we both get frustrated. He obviously started getting hold of my finger to stop me pulling back, because he thinks what I'm rewarding him for is putting one foot on my finger, and unfortunately he's just faster than I am. Any suggestions please?? It's really really hard to teach budgies and cockatiels to wave because they're not used to holding their feet up high (and they don't eat with them). It took a month of hard patient work to [url=http://www.youtube.com/watch?v=-OorU63fNbQ:204dn7s3]teach it to a budgie[/url:204dn7s3]. The technique is similar but takes a lot of work. [url=http://TrainedParrot.com/Turn_Around:204dn7s3]Turn around[/url:204dn7s3] and [url=http://TrainedParrot.com/Tube:204dn7s3]go through tube[/url:204dn7s3] are easier tricks to teach a budgie. Well, what do you know....I went to carry on working on the wave thing in my 'tiel's training session this morning and he just did, first time, as soon as I gave the command!! And he's done it every time since. Only third day of training (on the wave) and yesterday I couldn't see any sign that he understood what I was asking.....as I said in my message yesterday he just kept trying to step onto my finger. Blow me down. I'm amazed. Yay Scout! [quote="janetafloat":1zhkudv5]Well, what do you know....I went to carry on working on the wave thing in my 'tiel's training session this morning and he just did, first time, as soon as I gave the command!! And he's done it every time since. Only third day of training (on the wave) and yesterday I couldn't see any sign that he understood what I was asking.....as I said in my message yesterday he just kept trying to step onto my finger. Blow me down. I'm amazed. Yay Scout! [/quote:1zhkudv5] I've found animals have a way of doing stuff like this lol and proving you wrong.